Here we go friends, this took longer than i had anticipated, i want to post it tonight because i promised you that, it may need another edit or two. Please message me or comment if you find errors or the instructions are not making sense to you, i want to fix my human-ness. i know you are all way too intelligent to need this explanation but some have asked…..any teal turquoise words are links to other information or posts, hover over them with your mouse and an explanation will pop up. Click on the words and you travel to a whole new story or earth shaking information. Blessing’s gift blanket is a wonderful fluffy soft pile of warm snuggle. i suspected we would need a cooler option for the hot humid summer in our not air conditioned home. We came up with this version, we are very happy with the finished product. i would recommend this approach. You could add a fleece duvet if you find you want more warmth or soft fuzzy snuggle. This blanket is compact and will be very easy to launder. The streamlined design also made the construction process very manageable on a standard home sewing machine. Our first weighted blanket is on the left, the summer version is on the right. 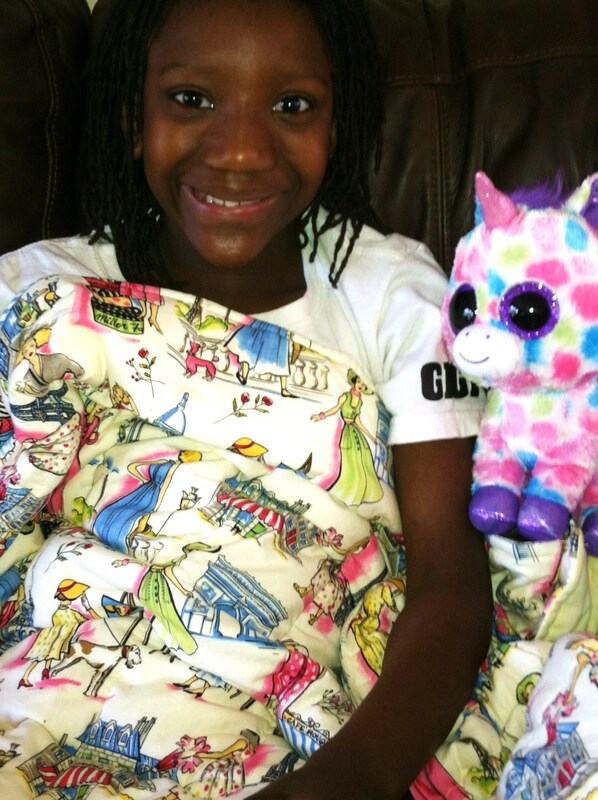 Blessing’s gift blanket is perfect. This is not an improvement but rather another option. i will provide links to my materials at the end of the post. How many beads? The standard is 10% of your body weight plus one pound. More is fine and additional weighting will bring deeper comfort to some. The only caution you need to consider is being certain you are able push the blanket off and get out from under it. For Blessing i took her weight: 55lbs x .10 = 5.5 pounds + 1 pound = 6.5 pounds. Our beads came in a 9 pound lot; i chose to use all of them as she has proven she is loving the intense weighting. Our finished blanket weighs a total of 11.5 pounds. It is perfect for our girl. i chose to layer fabric, batting, beads, batting, and fabric for my design. i wanted the beads sandwiched between layers of batting to soften the feel of the beads against her skin. Blessing has intense sensory challenges and i was concerned the firmness of the beads may be irritating for her. Cut the fabric in half, this will give you two pieces that measure 45” x 81”. 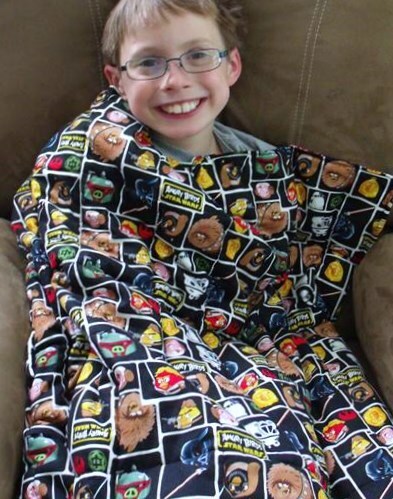 i bought our fabric in two 2 ¼ yard pieces as i wanted different fabrics for the back and front of the blanket. You could make the blanket shorter, i wanted this one to be twin quilt length. Pre wash and dry the fabric. Take one piece of your fabric and draw a grid pattern on the right side of the fabric. You could avoid this step if you chose a fabric with a grid pattern on it. Use a fabric pencil so these lines will wash out. This is forming the pattern for the pockets that will hold the beads in place. You may make the pockets whatever size you wish. 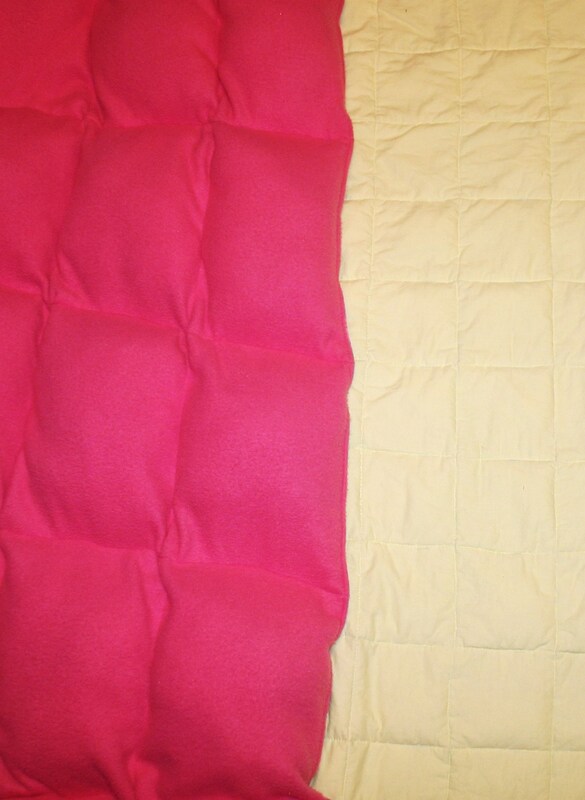 This picture shows you that the pockets on Blessing’s winter blanket (pink) are larger than what I chose to do for her yellow summer blanket. I used a 10 x 20 grid, giving me 200 pockets. My squares are approximately 4”x 4”. This step took me 3 hours, less squares = less time. Pin the fabrics with right sides together on three sides. 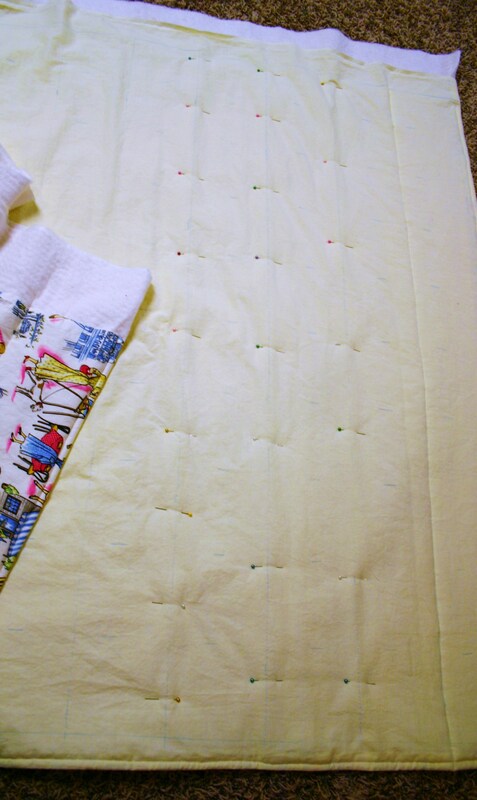 Sew these three sides (red lines) using a ½ inch seam allowance. i chose to sew both short ends and one long side. i found it easier to add beads using this design. Add both layers of your batting and re-sew the same three sides. 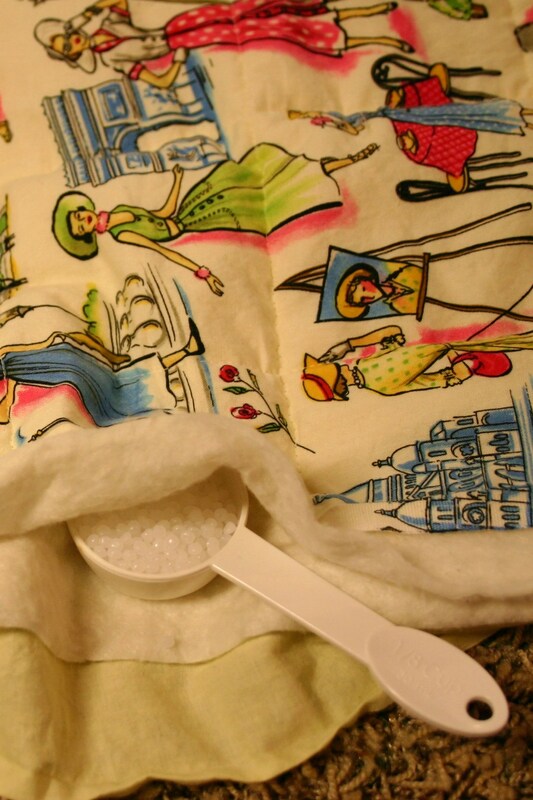 It will be easiest to do a neat job if you put both layers of batting on top of the fabrics. 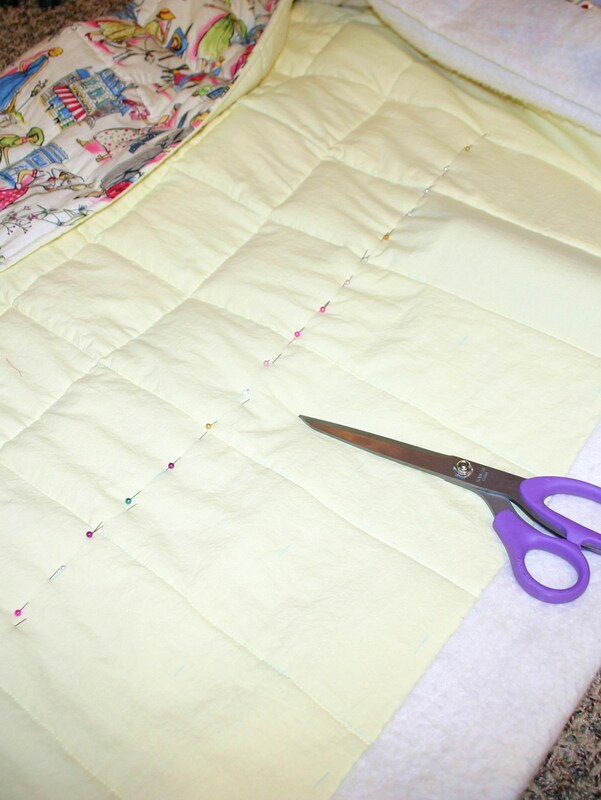 After you have sewn the batting to the fabric on all three sides, turn the quilt right side out. 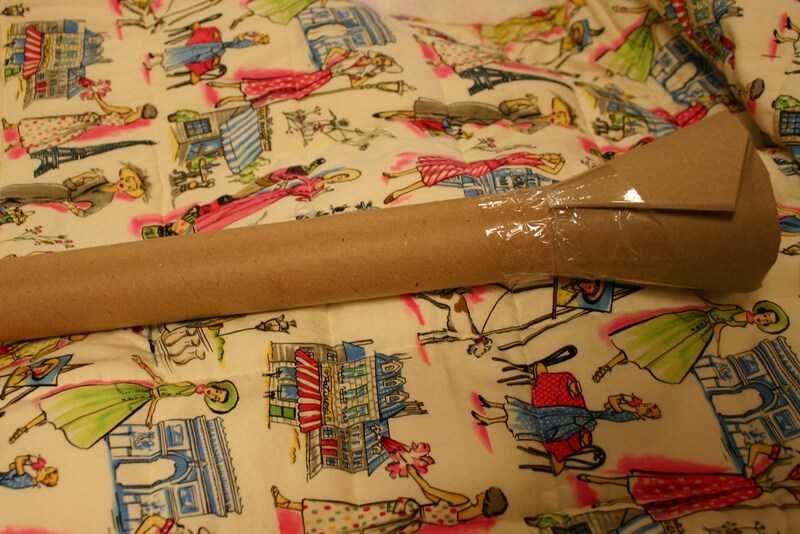 You should have a large envelope that consists of fabric (right side visible) on the bottom, two layers of batting in the center and fabric (right side up) on the top. Top stitch (blue line) 3/8 inch from edge on the three sides you have sewn. This adds durability. These are the shorter vertical lines in your grid pattern, pin through all 4 layers of fabric and batting on line. Sew on the lines you drew earlier to create columns for beads. I pin and sew three lines at a time, working from the center out. You are going to add enough beads for one pocket to each column in between the two layers of batting. Working across the quilt use the correct measure of beads per pocket and pour them into each column. 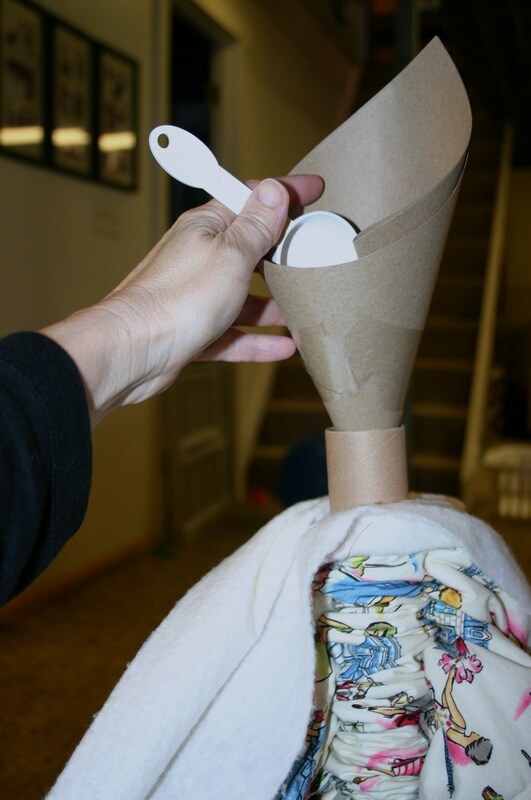 I used a home crafted funnel to help the beads fall to the bottom of the column. Once you have placed beads in one column, pin that column shut on the first horizontal line locking those beads in place, move on to the next column, add one measure of beads, pin that pocket shut. Once each column (20total) has its first measure of beads, you will sew the first horizontal line across the quilt which will lock the first row of beads in place. Move up the quilt adding one row of beads at a time and sewing one horizontal line to lock them in place. Sewing over a bead will break your needle, be careful! How do I know how many beads go in each pocket? 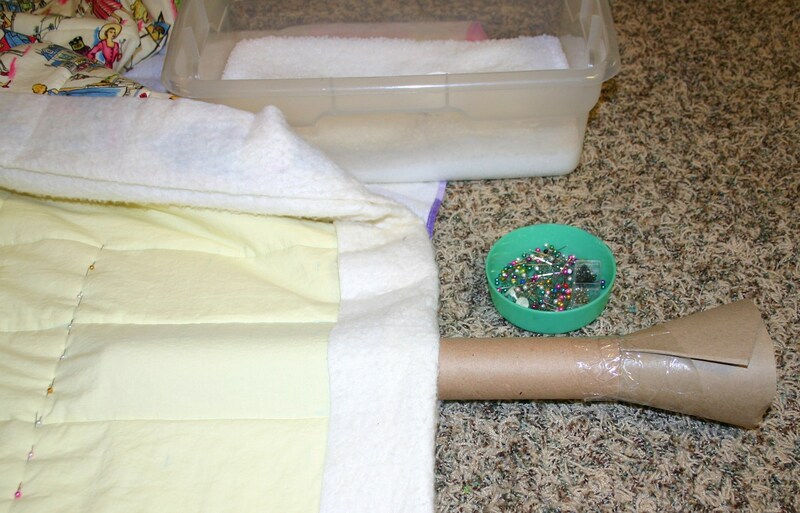 Using a kitchen measuring cup measure the volume of beads that you want to use in your blanket. My 9lbs of beads measured 28 level cups. There are 16 tablespoons in one cup. 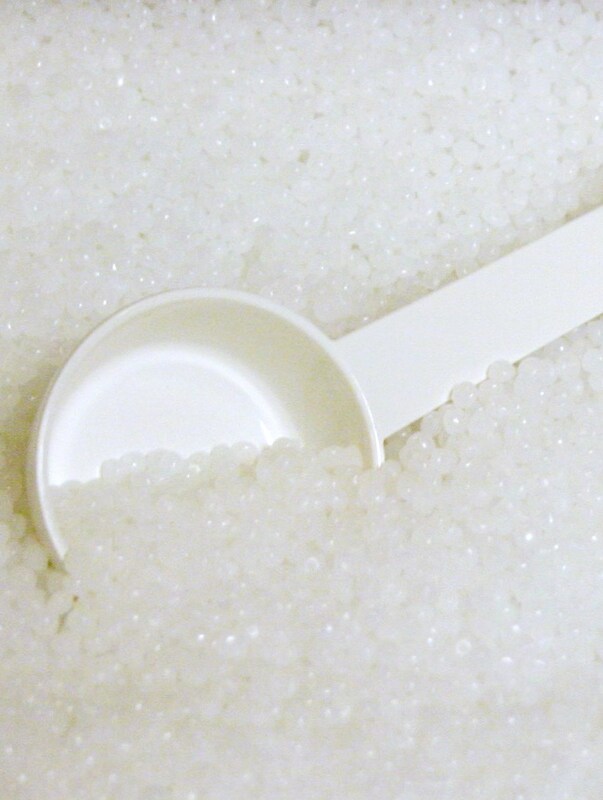 I had 28 cups x 16 tablespoons = 448 Tablespoons. 448/200 = 2.24 (2 1/4) Tablespoons of beads per pocket. I used a 2 Tablespoon measuring spoon and made sure it was generously full. Because I am neurotic, half way through I measured my remaining beads, this allowed me to adjust my per pocket measurement at this point. I did a final measure and adjust with just two rows (40 pockets) remaining. It would be possible to get to the end of the filling and not have enough beads for the final pockets or to have beads left over making your blanket lighter than you had planned. All of this would be easier with fewer pockets. 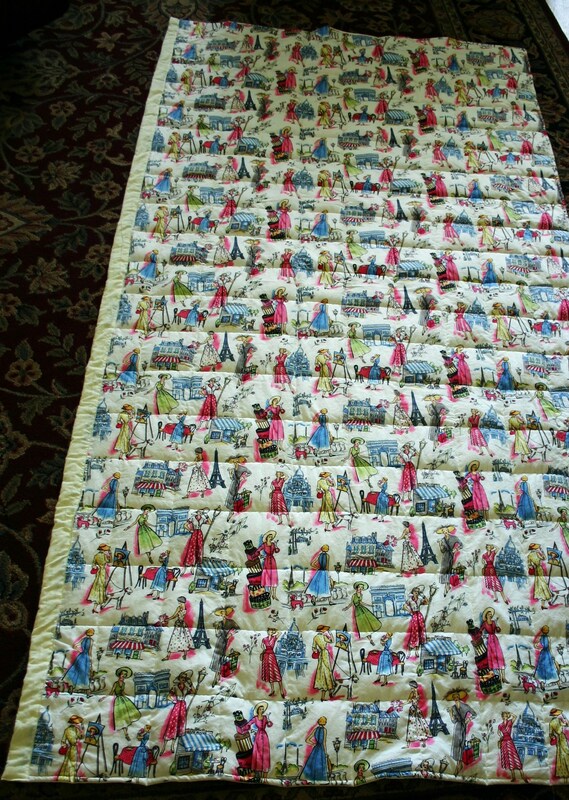 The large number of pockets made a very smooth evenly weighted quilt, i like that but it is not necessary. There are many options here. I was going for simple and functional on this quilt. My backing happened to be 2 inches wider than my front fabric. i simply trimmed the extra batting to match my front fabric size, i folded the back fabric over the front edge and top stitched through all layers. My edges were both factory finished (salvage) so I did a simply single fold, if you have a cut edge you will need to do a rolled hem. I tend to be asymmetrical so I happen to like the one sided look this created. I may add a strip of rick rack trim down the yellow stripe. Cute! Right? This project is not technically difficult. A beginner sewer could accomplish it. If you are a new sewer be prepared to stick with it, it is time intensive. You could use larger pockets to make the process easier, i feel you could go as large as 8”x 8”. 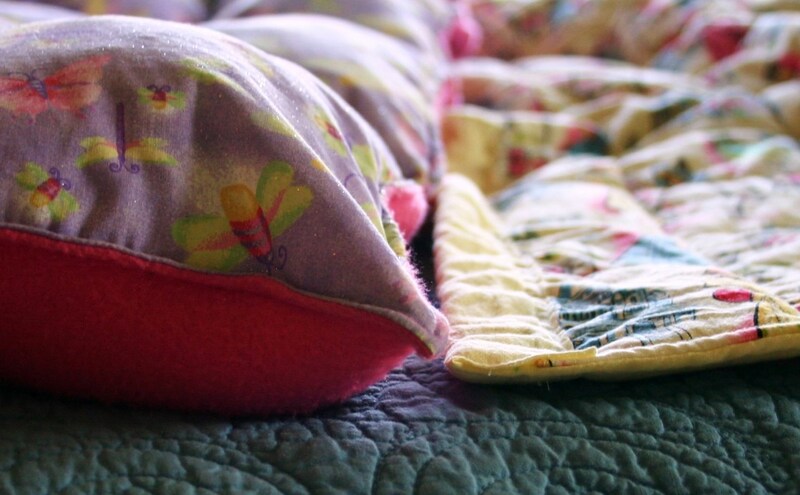 Your final quilt may not be as perfectly square or smooth but it will be perfectly functional and comforting. My materials cost me $60.00. A comparable quilt would cost $200.00 – $400.00. My total time invested in this project was about 12 hours. A dear friend of mine, a brand new seamstress made a quilt along side me and it is perfect for her little man. Blessing continues to be HUGELY helped by her weighted blanket. It truly has been miraculous for us. If i can answer any questions or step you through this process, please leave a comment, a facebook message or send an email. i would be honored to help you however i am able. Here are a couple Youtube videos for your entertainment. I want to make a twin-size weighted blanket so it won’t slip off…but do I put pellets all the way to the edges? Is this too much weight wasted on the bed? Shpukd i add more weight to compensate for “at the edges and foot” areas? I would still use the formula for determining weight given here and i would disperse the beads throughout the entire blanket. Some of the benefit of the weight is the “pulling’ affect of the weight in the blanket that is surrounding you not just what is directly on top of your body. Good Luck, i pray it brings lots of comfort !!! Love your instructions! I want to make a weighted blanket for my daughter but most of the instructions I’ve found leave something to be desired. Not yours! Thanks for sharing!